The rustic decor, traditional haute cuisine, and magnificent riverside location of Chez Franois make it the perfect landing spot. You can dine in the formal indoor dining room, which has a comfortable antique feel, with wagon-wheel chandeliers, vintage French posters, floor-to-ceiling aubergine drapes, and brick walls left over from the building&apos;s previous life as a sail loft. (The site is actually a National Historic Landmark.) There&apos;s also the outdoor Riverside Cafe, which boasts an open porch with wrought-iron seating that&apos;s perfect for a more casual relaxing evening and attracts a "rowdier crowd," as owner Matthew Mars calls it. 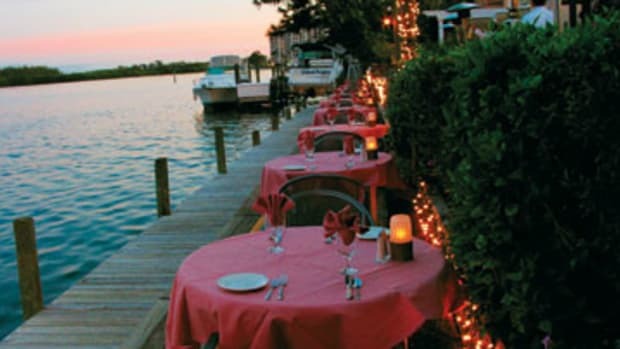 Boaters can pull up to one of the three slips that can accommodate boats to 63 feet and head inside to enjoy the Signature Dinner, a prix fixe meal that uses only in-season ingredients. Chez Franois is famous for the artistic designs of its elaborate dishes, including smoked salmon on Osetra caviar, fromage du jour (cheese selection of the day), filet mignon over white and black truffles, and escargots au basilica (escargot with basil sauce). With more than 600 wines to choose from on the Captain&apos;s List, the restaurant prides itself on having the biggest selection of vintage wines in northeast Ohio. C&apos;est magnifique!